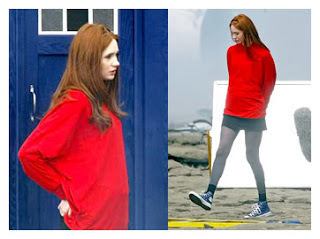 I haven't really tried to cosplay Amy Pond, mostly because I'm not tall or a redhead. But I like some of her clothes and I've acquired a few pieces. And I'm on the hunt for a few more. 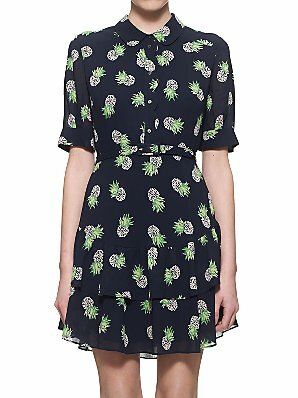 I have the Noa Noa West End Wool Dress (Mist Melange), a tank (not screen accurate, this one in Loganberry) to go under it, and the Dr Martens Triumph 1914 Boots (Black), though I need to change from the ribbon to regular laces. Folks on the DW LJ comm did note that she definitely uses the regular laces, and tucks them behind the tongue of her boots. I still need the Noa Noa Basic Vera Scarf in Rug, and grey Oasis Biker Jacket. And purple tights (Noa Noa Basic Tights in Persia. ), though I think the screen accurate tights are definitely long gone. 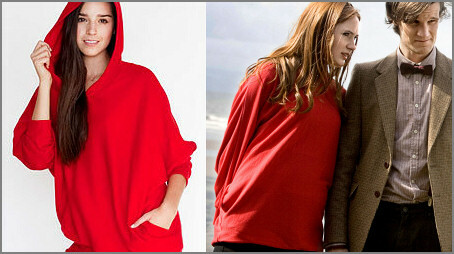 I also have the American Apparel Dolman Sleeve Hoodie (Red) from The Time of Angels/Flesh and Stone. I need to find an appropriate skirt and grey tights and Chucks. Amy's Dinosaurs on a Spaceship sweater appealed to me and I snapped it up right away, though I have no real intention of completing the outfit (which is just jeans and brogue shoes). 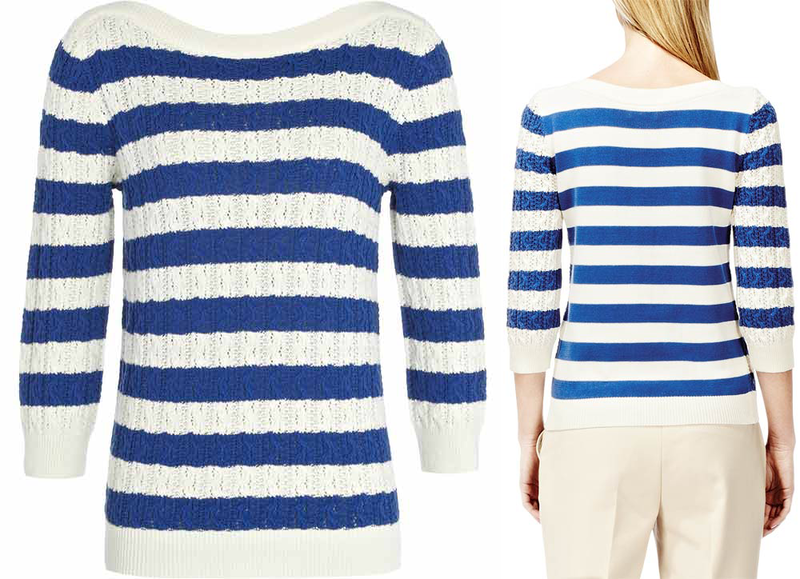 The sweater is a Reiss Chloe Stripe jumper in Ultra Marine. 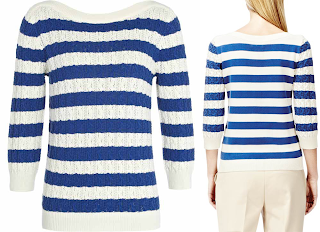 I really love it - it's one of my favorite sweaters. I would really love to find this Whistles Pineapple dress - and I'm toying with trying to make my own fabric. That's pretty low on the list though. I love this gown, but I don't know when I will get around to making it. Many years ago M&J Trims had the screen accurate trim on sale, and I bought some (hopefully enough, since it wasn't cheap!). So this is a placeholder to remind myself that I have it! I also found screen accurate fabric for the "peach" gown worn at the end of the movie. It might be a slightly different colorway, but it's extremely close. I really need to get my act together on this one, I've wanted to make it for ages! I have so many bits and pieces of things I've acquired in case I do a particular costume (and I come across a screen accurate item for it), and I feel like I'm almost losing track of what I have and what I need. So I think I'm going to start a tag for these projects so I can keep better track of them! Here goes! I'm going to use the tag "screen accurate finds." 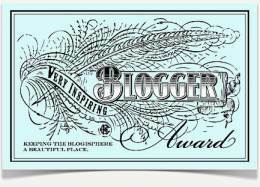 Cool - two people awarded me the Very Inspiring Blogger Award! 1. Display the award and link back to the person who nominated you. 2. State 7 facts about yourself. 3. Nominate 15 bloggers for the award. 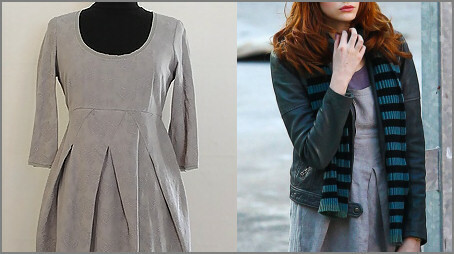 1) Thank you so much to Chelsea from http://asartorialstatement.blogspot.com/ and Loren from http://costumerscloset.blogspot.com/! Here's the award - yay! - I also write, and I wrote a short story that will be in an upcoming anthology. It's of geek interest, so I'll probably pimp that here when the time comes too! - I love The Simpsons (at least "classic" Simpsons) and I've recently become obsessed with the Tapped Out iPhone game. It's a guilty pleasure. - I've been watching Magnum, PI on Netflix and really enjoying it. The short-shorts, high-waisted pants, and barely buttoned shirts are highly amusing. - This is no secret, but I LOVE the Beatles. - I'm terribly excited about the new season of Mad Men, which starts SOON! - I'm a breast cancer survivor. Not something I told a ton of people about when I was going through it a year and a half ago, but since I'll have to worry about it the rest of my life (such is the fun of any cancer), I figure I might as well own it now. :-) Seriously, though, I'm fine. I was lucky and it was caught early, and though it was not in my plans, I am very grateful it wasn't worse. - Before the Automobile - Talented, beautiful, and one of the sweetest people I've met! - The Fashionable Past - One of my oldest costuming friends, and I am absolutely inspired by her work. Her tutorials have been invaluable to me as well. - Rebel's Haven - Impeccable work, she always looks amazing in her costumes, and she is a great resource! 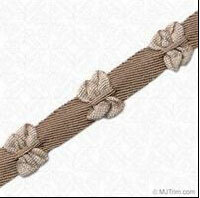 - Diary of a Mantua Maker - I admired her work online long before I met her! Everything she makes is amazing (I want one of each! ), plus she makes her own shoes. - Seamstress of Avalon - Talented costumer, talented writer, and someone I hope to meet in person one day soon. - Festive Attyre - Another costumer I admired long before I had the pleasure of meeting her. Gorgeous costumes, beautiful photography, and someone I like very much as well. - The Costumer's Closet - Ok, she nominated me, so I don't expect her to do this again, but she's an amazing friend and costumer - and I owe a bunch of my costumes to finds from her stash! - Madame Modiste - Another one of my favorite people - I love how she brings her personal aesthetic to her costumes. - It's Always Someone's Birthday - A non-costuming friend. I'm really proud of how she turned the idea of a blog about her passion (baking!) into a reality. And her cakes are both beautiful and delicious. - Jenny LaFleur - She throws amazing parties, and has great taste in costumes. I reference her tutorials a lot. - Betsy's Costumery - Another majorly talented friend who makes it look easy. Her Idris and Effie costumes are flawless. - Ashlee's Costume Closet - Ashlee has done some amazing work - Dark Lily, Marie Antoinette's Masquerade gown, Pink Diamons, and more. She has wonderful attention to detail and I love seeing what she'll come up with next. - A Fractured Fairytale - Great taste and style, and if her costumes would fit me, I'd steal all of them. Also one of the sweetest people I know. - Ailionora - One of my best friends - a costumer, author, and generally inspiring person. Whew, ok, that's 15! And only a drop in the bucket of the many many talented costumers I know and/or follow!